The environmental watchdog has singled out the coast of Xgħajra as the only viable location for a “major” land reclamation project – a move that is not likely to go down well with developers, this newspaper has learnt. 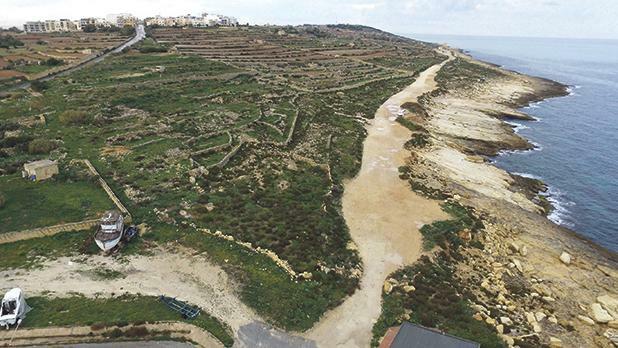 Sources in the Environment and Resources Authority told The Sunday Times of Malta that the stretch of south-eastern coast between Żonqor and Fort Ricasoli had been identified as the only possible site for any large-scale land reclamation projects. Far smaller projects could also be considered in other locations across the island, but with strict controls and mitigation measures. Government sources said developers keen on large-scale land reclamation investments were hoping to realise their dream projects in a number of other spots across the island and would likely not be keen on limiting them to the area around Xgħajra. A team of technical experts at ERA has for the past few months been conducting a marine survey of the entire coast of Malta to identify sites where land could potentially be reclaimed from the sea. “The team started by establishing the criteria that would rule out a site – say protected marine habitats or the presence of particular species, and then went around the whole coast in a process of elimination. “Essentially, the team arrived at the stretch of coast around Xgħajra as the only possible site for a large-scale land reclamation project. The rest of the island was eventually ruled out for some environmental reason or another,” an ERA source said. So what could exclude a site? ERA sources were quick to point to Posidonia Oceanica meadows (seagrass) that lie over large tracts of seabed at various depths around the coastline as a key constraint. The ecological significance of Posidonia meadows is well known in terms of stabilising the seabed and serving as nurture grounds for a large variety of marine organisms. Read: Land reclamation; Potemkin islands? Other parts of the coastline were ruled out as they are mating grounds for protected species, or due to unique subaquatic geological formations. However, although the ERA believes large projects should be restricted to the Xgħajra coast, its technical team conceded that much smaller projects – “such as the extension of a seaside hotel’s lido” – could potentially be allowed in certain bays around the rest of the island. Although they would not identify any of the potential sites that could host these “smaller” projects, the sources said that this would be a bone of contention with environmentalists when applications were ultimately submitted. “This will be a hot potato as the definition of ‘small’ will likely be very different for developers and environmentalists,” one source privy to the process said. Government sources yesterday indicated that while the ERA may have been cautious in its assessment of possible sites, this did not mean it would be the final position on where and how land reclamation would be allowed by the Administration. In 2013 the government launched an international expression of interest for potential land reclamation projects, receiving 21 proposals that were reviewed by an internal selection committee. Government sources said the proposals had included projects all over the coast of Malta, some of which were described as “massive” while others were being viewed as “more realistic”. Read: Could tunnelling feed land reclamation? Bidders for land reclamation ventures had to pay a €5,000 fee for the expression of interest, and were bound by a confidentiality agreement. No policy currently exists to regulate land reclamation but the new Strategic Plan for the Environment and Development does include a glancing reference to the subject. Government sources said a new policy specifically on land reclamation was in the offing. Meanwhile, among those interested in possible land reclamation is Seabank owner Silvio Debono who has already said he wanted to spearhead a €150 million real estate project out at sea. Although he has not disclosed where his potential project would be built, he did say he was confident that the government would move in this direction in the future. Another business giant, Tumas Group, has also expressed interest in reclaiming about 125,000 square metres of the seabed in St Julian’s in recent years, in the hope of extending the Portomaso complex to accommodate dozens of new luxury real estate units. Government sources said the construction of an artificial island along the Coast Road opposite Qalet Marku had also been among the proposals received. Talk of possible land reclamation has rekindled in recent months, particularly as the government steams ahead with plans to dig a 13km-long tunnel linking Malta to its sister isle Gozo. Government sources said land reclamation was being viewed as the main way to deal with the waste that will be generated from digging the subterranean tunnel. Land reclamation is not an entirely new concept to Malta. The Marsa sports facilities sit on reclaimed land, the sea originally reaching inland as far as Qormi. Msida is another example of a major land reclamation project on a local scale, together with large parts of the Freeport in Birżebbuġa.